Hello Travelers! 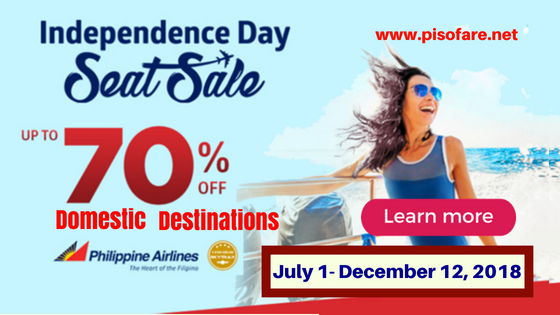 Booking for Philippine Airlines Independence Day Seat Sale is extended until June 17, 2018! Book your ticket for your July to December 2018 flights via the Philippine Airlines promo fare and enjoy up to 70% off on base fare. Promo selling period is from May 28 to June 17, 2018. For the PAL Domestic seat sale, promo tickets are available to 33 local destinations. Domestic sale tickets of Philippine Airlines are good for one-way Economy Fares. Except the promo on specific flights, Philippine Airlines travel period is divided into two: a) July 1- September 30, 2018; and b) October 1- December 12, 2018 but with blackout dates. To prove that the PAL promo fare is legit and true, we search for sale tickets online and shared sample ticket booking below. How to Get PAL Sale Tickets? Avail Philippine Airlines promo fares by booking online at www.philippineairlines.com. Promo Code not needed when booking. Buy the sale tickets at Philippine Airlines ticket offices, accredited booking agencies and travel agencies. Contact the Philippine Airlines Ticket Reservation Hotlines and book tickets with their CSRs. Want to travel via Philippine Airlines to your desired destination? Reserve your ticket as soon as booking starts! Seats on promo are limited! For more Philippine Airlines seat sale, Cebu Pacific Piso Fare promos, Air Asia Red Hot Sale 2018- 2019, Follow us in Facebook: PISO FARE TICKET!